You can bid farewell to the days of Apple's theatrical OS reveals -- at least until OS 11 rears its head, anyway. In the meantime, the outfit has seemingly been content to strip away more and more pomp and circumstance with every subsequent big cat release. Lately, the company has settled into an evolutionary release schedule, eschewing full-fledged makeovers in favor of packing in lots of smaller changes, many of them quite granular indeed. It's a trend that can be traced as far back as 2009's OS X Snow Leopard (10.6), a name designed to drive home the point that the upgrade wasn't so much a reinvention of the wheel as a fine tuning of its predecessor, Leopard. The arrival of Lion (10.7), though, marked a full upgrade. With features like Launchpad and Mission Control, it seemed like it might be the last version Cupertino dropped before finally pulling the trigger on operating system number 11, and perhaps transitioning to something with an even stronger iOS influence. Right now, at least, the company's not ready to close the book on chapter X, but it is giving the world a first peek at 10.8. Ladies and gentlemen, meet Mountain Lion. What can we say? It's more of the same: this release introduces a slew of feature enhancements, and of the ones Apple is highlighting, practically all were borrowed from iOS. And we do mean borrowed: the company has cloned some of the best features from its mobile platform. Until now, Mission Control has roughly approximated the iPhone's grid layout in a desktop setting -- but that feature always felt like a bit of an aside, something the user could safely ignore if he or she saw fit. This time out, the mobile influence is far more robust, baked in to the point that it will almost certainly force upgraders to adjust their workflow. We got our hands on an early version of the OS -- so early, in fact, that it's something of a pre-developer build. (Heck, there isn't even an image of a mountain lion to choose from in the default wallpapers.) The version available to developers today should address some of the kinks we encountered during our testing, not that we suffered all that many hiccups. So what's new in this version? Mountain Lion marks the first major OS X release since since the public version of iCloud rose from the ashes of MobileMe last fall. Predictably, 10.8 sees a much deeper integration with Apple's revamped service. Early on in the installation process, you'll be asked to sign into or create an iCloud account, choosing your .Me address, which, as the system points out several times, cannot be changed later on. As annoying as it might be to create yet another account with yet another web-based service, we highly recommended it. 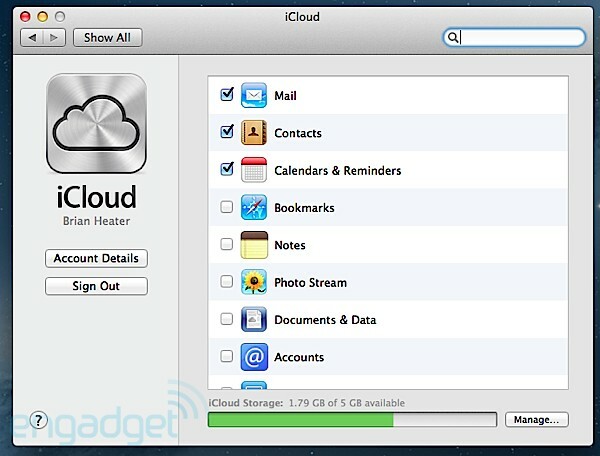 If you don't launch yourself into the iCloud, you'll be missing out on some key features. When you sign in, the system will merge information stored locally with what you've already uploaded to iCloud. Using iCloud's automatic setup, you can sync a slew of essential functions across your PC, iPhone and iPad, including mail, messages, contacts, reminders and calendars, among others, and you can opt into each thanks to a series of checkboxes. 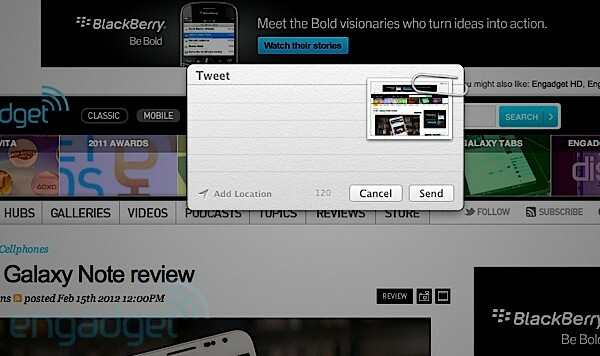 A quick click on the usage meter at the bottom of that screen lets you manage the content you're storing the in cloud. All in all, a quite painless process. iChat, you've had a good run -- well, a decent one, at least. But Apple's desktop messaging system was never quite so user-friendly as the one offered up in iOS. 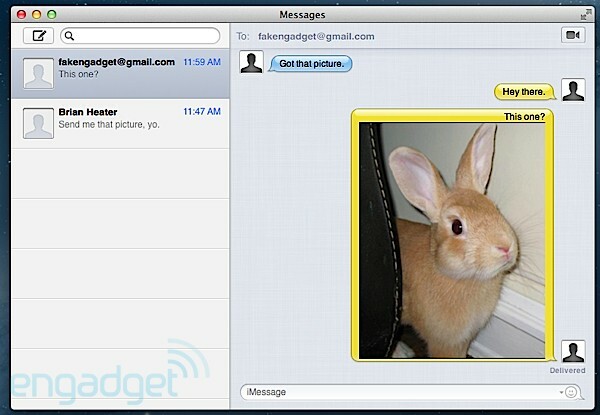 So, rather than trying to make iChat more like iMessage, Apple is simply swapping one out for the other. That's a theme you'll see here across these updates -- where Apple found a shortcoming in OS X, it didn't rejigger the existing app or attempt to start from scratch; it simply ported functionality over from iOS. As with iCloud, Apple does what it can to get you started with the feature as quickly as possible -- the system will prompt you to sign up when opening Mail, or an email message in Safari. (Of course, folks who want to breeze through the setup can always click the word bubble icon in the dock to launch the app later on.) Upon opening Messages for the first time, you'll be greeted by a quick-and-dirty overview of the beta service, which lets you send "unlimited messages to iPhone, iPad, iPod touch or Mac, right from your Mac." In a nutshell, then, the app breaks down whatever divide previously separating the Mac from iOS, allowing you to jump into a conversation on any (Apple-made) device. Using the service, you can send messages, documents, HD videos and photos (up to 100MB apiece) to one person or several, using phone numbers or email addresses as points of contact. Do keep in mind that just because Apple has put iChat to bed here doesn't mean that all of the service's functionality is gone -- iMessage still incorporates chat services like AIM and GChat. Messages sent through the service are encrypted, and the app also uses a notification to let you know when messages have been delivered / read. All in all, it's a cleanly designed and incredibly easy to use feature. The majority of the screen is devoted to the current conversation. In general, really, the layout should prove familiar to anyone who has used the mobile version of iMessage. Messages come through in the form of different colored word balloons. Your friends' avatars will appear here, with the word balloons aligned with their faces. As with the movie version, ellipses let you know when the person on the other end is typing. Images sent via the service will show up as previews. Clicking the camera icon along the top of the screen will turn the conversation into a FaceTime chat for when your carpal tunnel proves too intense. Still, it's also obvious that Apple's tweaked the app to take advantage of the extra screen real estate you'll get on a Mac. All of your conversation live on the left side, with large icons for each person you're chatting with, along with their names and text previews. In the case of group conversations, you'll see multiple pictures laid over one another. Unread conversations are marked with a blue dot, located next to your buddy's avatar. At the top of the column is a search bar that lets you quickly find something buried in those threads -- curse your incredible popularity. Here's another iOS feature ported over to the desktop. 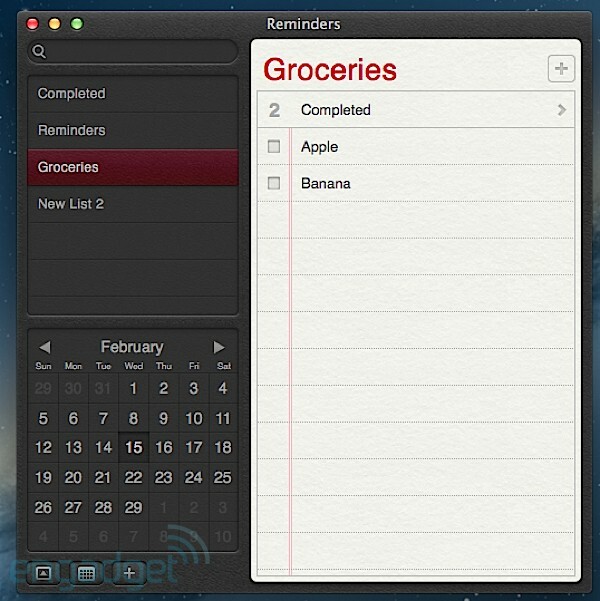 For those keen on making reminders -- or simply not forgetting things -- the app helps make and track to-do lists. As newcomers might expect based on the name alone, these lists are styled after pieces of binder paper. Whenever you complete a task, simply tick the box next to it and it'll disappear from the list. Clicking the "i" icon next to an entry lets you set a reminder date, shuffle the priority rating or transfer it to a different list altogether. Lastly, that small calendar icon lets you sort tasks by date. With us so far? Good. It is indeed easy to use, though it's hardly revolutionary. It's certainly handy that the app can sync with things like Google and Yahoo Calendar, but the real key here, as with other new features we'll tell you about, is how nicely its pairs with iOS, syncing your reminders and lists across your various iDevices. It's easy to see this feature becoming a handy part of some people's daily routines, but Reminders also isn't likely to turn you into a list-making type if you're not already. If you got excited by the prospect of Reminders, boy are you going to like Notes. Another juiced-up iOS feature, Notes is a simple way to, well, you know, make notes about stuff. Like its mobile counterpart, the OS X version is designed to look like a legal pad, complete with ripped edges. Apple takes advantage of the additional screen space by adding a search function up top, along with a side column listing all of your notes. Double click a note, and it'll pop up in its own window, which will live on top of the desktop even after you close the Notes window. The OS X app also allows for richer features like images, links and additional fonts. Again, not the most titillating feature in the world, but the big selling point is the fact that your various jottings can be synced via iCloud. Again, not a bad thing at all. At last, one of the more prominent features in Mountain Lion. It's a small aesthetic change at first glance, but it will arguably go the furthest toward altering your workflow, if and when you first make that leap to 10.8. When you first fire up the operating system, you'll see a circle icon on the far right side of the top menu bar, where the Spotlight lives in Lion (that's since slid over to the left, ever so slightly). It's best described as a target with a black hole at its center. Get a message and the center of the target lights up blue, and an alert pops up in the new notification stream. Click the icon once, and the desktop background will shift to the right (the dock on the bottom and the menu bar up top stay put). In keeping with Apple's previous attempts to make your trackpad more touchscreen-like, you can also pull this off with a two-fingered swipe. Click on the menu icon, swipe in the other direction or tap anywhere on the desktop, and everything will shift back to normal. If you've ever wondered what Apple was saving for the area just to the right of the main desktop, here's your answer -- this is where your notifications live. That iOS 5 feature, which took a few cues from Android, lives here on the Mac. So, get used to pulling to the left, not from the top. It's a change that makes sense given the Mac family's screen orientation; there's just more real horizontal screen real estate to make use of. Though the placement is different, the notifications sidebar is nearly identical to the iOS version, right down to the lightly crosshatched gray background. Unlike Launchpad and other Lion features you could easily avoid in daily use, Notifications are tough to ignore. When installing 10.8, you'll be prompted to tie in all of your accounts, and once you do, messages become a part of your desktop, with a steady stream of banners lining the right side of the screen. Mail, messages, reminders and the like will pop up, stick around for five seconds and then migrate over to the notification center. Alerts like system upgrades and calendar events will stay put until you manually shoo them away. 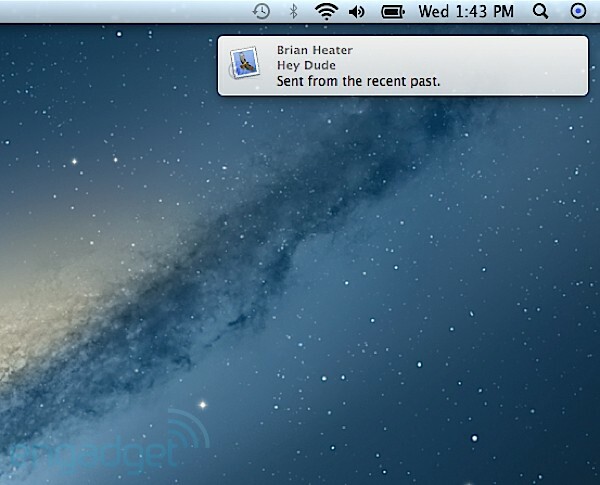 Notifications might be our favorite addition in Mountain Lion. Of course, all of this is quite customizable -- you can toggle between banners and alerts, add and remove sounds or even take notifications out of the equation entirely if you're easily distracted. 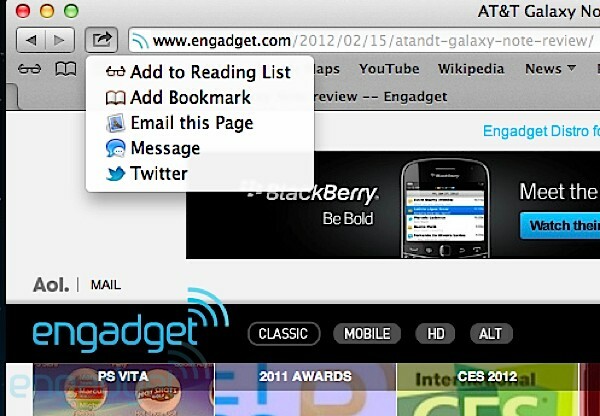 Still, we'd recommend sticking with them for a bit -- Notifications might well be our favorite addition in Mountain Lion. Apple will also be opening the feature up to developers via an API, which will let them build notifications to go with their Mac apps. What's that? You say you want more mobile functionality built into Mountain Lion? Great news, everyone! Apple is baking its sharing button into a good deal of native Mac apps, allowing you to instantly share content from your desktop via email, message, AirDrop and third-party services like Twitter, Flickr and Vimeo. Frankly, it's a somewhat surprising addition. After all, while the functionality makes sense on iOS, where it can be difficult to toggle between apps, you don't tend to hear all that many people complaining about the difficulty of switching between programs on PCs. In fact, that's one of the key things that to this day separates the Mac experience from its iPad counterpart. That said, the addition of small arrow icons for sharing content from Safari, Preview, Photo Booth, QuickTime and the like (iPhoto is still in the coming soon stages) is a nice feature. Click one of those arrows and you'll see an animated window with a thumbnail for the shared item and a list of local computers with AirDrop enabled. Choosing, say, Message, will black out the rest app, save for a small pop-up window, where you'll enter the recipients name and some text. As Mountain Lion moves toward a wide release, Apple will likely partner with services beyond Twitter and the others we mentioned. We're really curious to see if the company opts to embrace services by Google (YouTube, please) and Microsoft -- not that we're getting our hopes up. Yep, Twitter gets its own section. Why? Apple loves Twitter, that's why. Not enough for Tim Cook to get his own account or anything, but enough to sprinkle the microblogging service throughout the operating system. For starters, there's the aforementioned integration with Share Sheets (or Tweet Sheets, as Apple has cutely branded them), which let you tweet directly from various apps. 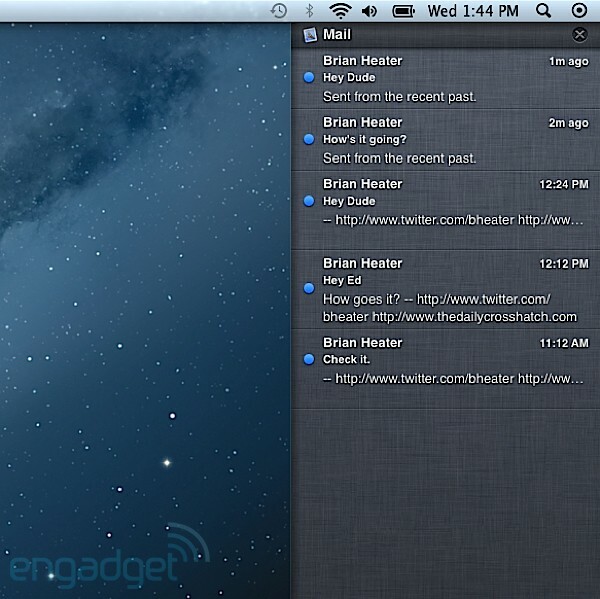 Twitter usernames and profile pics have been added to Contacts cards, and tweets will soon be integrated into Mountain Lion's notification stream. The feature is set to be built into the Mac App Store as well, at some later date. Here's one that's not quite ready for prime time. Game Center will be coming soon to a Mountain Lion developer preview near you, but as of this writing it's not quite there. Given the success of the app, which boasts some 100 million registered users, it's probably no shocker that Apple's imported the feature along with various other iOS offerings. As you'd expect, if you've used iOS recently, this brings social gaming to the desktop, letting you play against friends, keep track of high scores and carry on voice chats with opponents. Unfortunately, we had no luck getting this feature to work. Whether it was an issue with our network or just the fact that this was an early build, we can't really say. This is all pretty straightforward, though -- the AirPlay Mirroring you've come to know and love on your iPad is coming to your desktop. 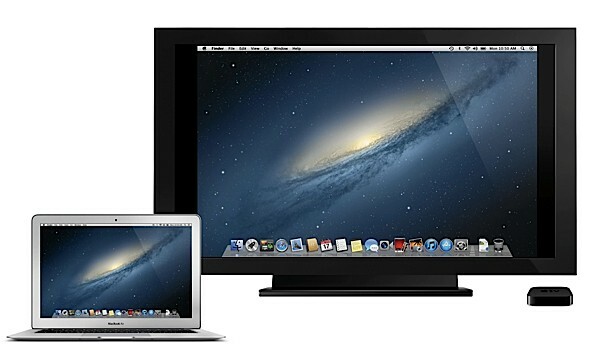 If you've got a Mac, high-def television and also an Apple TV, you're good to go. Set up those last two, and you'll see a triangle-in-a box icon pop up on the top toolbar, letting you stream 720p video to your HD display. Apple is also working to let users stream full-screen content directly from iTunes. Interestingly, due to rights concerns, some content will be blacked out on your desktop while playing back on the HDTV. And what of security? Apple's here to reassure us that just because OS X has a reputation for being relatively malware-free, that doesn't mean the company isn't actively working to gird the OS against various threats. In a sense, Gatekeeper is an attempt to extend the company's infamous (but secure) App Store vetting process to the entire web, creating a way to identify and block unsafe applications regardless of where they came from. The company is basically offering registered developers, with Developer IDs, the opportunity to create a secure certificate. Those developers will use that certificate to digitally sign any applications they create. Apps that are thusly signed can be safely downloaded and installed to Mountain Lion but, if Apple discovers any cause for concern with apps created by said developer, all apps signed by that certificate can be blocked. There's more flexibility here than in the App Store, thankfully. Users can opt into three security settings, with the most strict allowing only software from the Mac App Store to be installed. The next step down allows software to be installed from anywhere, but all software must be signed as described above. The final option is to open the gates and allow anything to be installed from anywhere. Even if you use the second security option there is a manual override, which could be useful if you really want to install that older version of TweetDeck you found online. 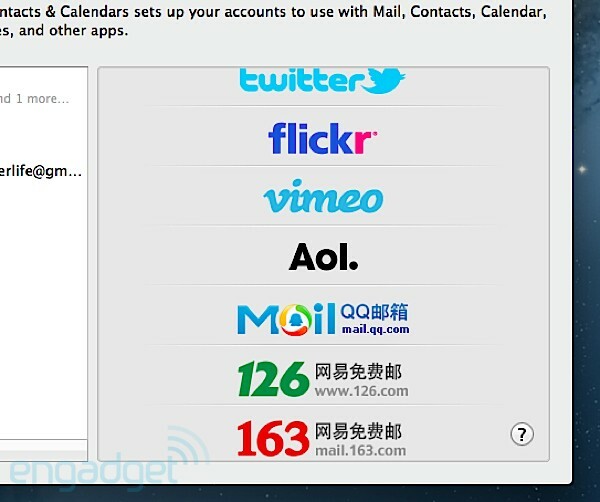 Mountain Lion also brings a litany of improvements for Chinese speakers, including better word and phrase suggestions, autocorrect, enhanced handwriting recognition and the ability to type in English without changing keyboard settings. The popular Chinese search engine Baidu will be built into Safari, and services like Sina Weibo, Youku and Tudou will fill out the Share Sheet options. It was with Lion that we really started to see a blurring of the lines between mobile and desktop, and in a lot of ways, Mountain Lion delivers on that promise. Really, it's not unlike what we're seeing in the still-evolving Windows 8 and, to a lesser extent, Ice Cream Sandwich, which is determined to create some unity between Android phones and tablets. Of course, 10.8 is more than simply a mobile operating system ported to the desktop -- what we're seeing are ongoing revisions to a robust desktop OS. There's still plenty that OS X can do that the iPhone and iPad can only dream of. After all, features like Mission Control and Launch Pad are ultimately built on top of a rich desktop experience, and much like the Mac App Store, users can largely ignore them (though you'll be missing out if you do). 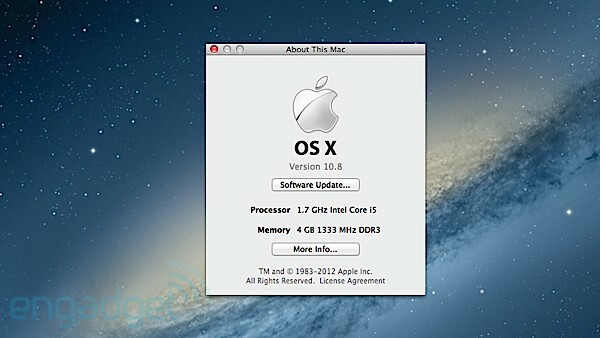 Mountain Lion feels like yet another step on a longer-term journey for Apple. Like its predecessor, Mountain Lion feels transitional. It seems like yet another step on a longer-term journey for the company -- a strategy Apple has hinted, at but never fully mapped out in public. For the most part, these moves are promising -- given the number of gadgets we carry around at any one time, a push toward integrating the mobile and desktop bits can't be a bad thing. What's slightly troubling, however, is the company's apparent attempt to exert as tight a control on its desktop operating system as it currently wields over iOS. Look at Apple's fight against jail-breaking: the outfit will go to great lengths to maintain quality control. Apple is simply taking pains to block bogus apps, but even that can be a slippery slope. In the company's defense, it is offering users the ability to opt out -- a courtesy not offered in the iOS App Store. As long as Apple sticks to that kind of relative openness on the desktop, we should be in good shape. As always, we're going to reserve final judgement until we can test a final version of the OS. For now, though, we like what we see. This may not be the jump to OS 11 we were expecting after Lion, but it certainly marks a promising step forward for the OS -- and one that's arriving a mere year (give or take) after its predecessor. And as for price? Apple isn't talking, but it seems a safe bet that it'll run around the same price as Lion.